Exactly halfway through the summer calendar now, it’s report card time – showtime – for those who annually bathe their beds and landscaping with the rich, varied colors of the season. For many, it’s a yearly labor of love; something looked forward to throughout the cold dreary months of winter. Many browse catalogs. Others search online. Always seeking that new look, that new color, that new wrinkle on an old familiar theme of nature’s matchless colors. Some spare no expense…lilies, roses, hydrangeas. Others go to no expense. And in recent years that’s where you’ve found the increasing value of summer annuals, for never before has there been so much to pick from; and never before has it been such a good value. 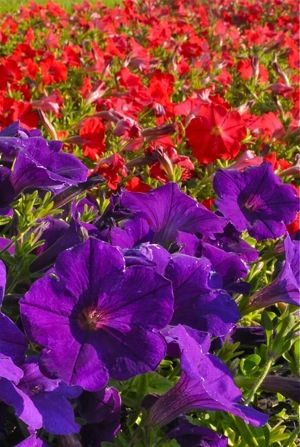 Use one color, or mix and match to make a striking contrast, as with these petunias. New varieties of an age-old favorite, petunias, make planting a complimentary landscape as enticing as your favorite candy shop, and they’re inexpensive. Impatiens, a long-time favorite for their hardiness and ability to do well in shaded areas, come in so many colors you can literally match to any exterior. Snap dragons, marigolds, and geraniums are all easy to grow, easy on the eyes, and best of all…easy on your budget. Some choose to go one variety. A bed of petunias the size of the one pictured above makes an impressive showing. Some choose to contrast one color with another. The inset photo of vivid purple and reds is very eye-catching. Others choose to mix and match variety and color. No matter, you can get a lot of bang for your buck, and the anticipation of having a whole new look next year. You can afford to. Annual color cost mere coins in comparison to roses, lilies and other expensive perennials. The best part! They will make your property look…like you’ve spent a fortune!